The Hartke HD75 combo amp pumps out 75 watts of power though a 12" half paper, half aluminum HyDrive speaker -- providing the best of both worlds. Overall: I bought this for my 13yr old son to use it with his Ibanez GSR205 4 stringer and Fairline 5 stringer for church. At 1st he wasn't to sure about the sound on it and after messing around with the parametric and graph equalizer frequencies he changed his mind and feel in love with the amp sound. There is no other amp with double equalization capability for $250. 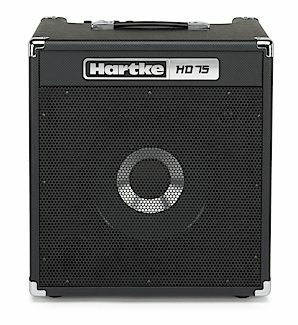 For a small to medium sized venues this is the RIGHT amp. The only con of it is that it doesn't have a line out to hook up to the pa system, but with a good bass mic will do great. Overall: This is a great small scale amp,the EQ is great for rounding your sounds. It seems very well built... I really like it, and so will you, great for practice, small beatnick venues...or just waking up the neighbors. Musical Background: Playing guitar and bass for 52 years. Music Style: Anything but opera and rap. Overall: The tone possibilities on this thing are endless. And the power is amazing. Birds outside are flying away, squawking WTF? This is much louder than a 200 watt 2x15" Kustom amp I had. You won't find anything better at this price. Overall: Bought this for sitting around the house and thumping on .after plugging it in I was very suprised at the quality and sound this amp has for the price.tight and clean and suprisingly loud.